When tramping with the kids. We have a wonderful time where great memories were made. As chief cook and food prepare I loved the convenience (and weight) of prepackaged pasta meals, high nitrate bacon and dehydrated peas for our main dinner. Followed by an adult only dark chocolate. Simple, easy to make, clean up. Wonderful. Being the nutrients guy I wondered about eating healthy in the bush. Fitness aside it is the B-vitamins that give you energy. 1 gram of fat (or one cubic centimeter) has enough energy to power a 100km walk! So it is not the energy we lack but the ability to turn this energy into stuff your body can use. Hence B-vitamins are so important as they are involved in turning fat (and carb's) into energy the cells can use. We take kids B-vitamins which we feed to them at rest points if they are getting tired, this tactic work well. So how could we increase B-vitamin uptake in the bush without taking in a home grown green stuff? I have a copy of Andrew Cowe's classic: A Field Guide to the Native Edible Plants of New Zealand.There are a couple of plants you can eat that are nutritious and easy to recognize. First up try the young shoots of Supplejack. It got is name as jack was the term used 150 years ago to describe something that was useful at a whole lot of things, hence jack of all trades. Find a growing end and snap it off. You can eat it straight, I've found it has a texture of asparagus (maybe this is a visual thing) and a taste that is vegetable like. Quite nice steamed with some garlic.... The only problem is that supplejack tends to grow upwards so fresh shoots don't tend to be within arms reach so you only find a few for each supplejack mess. Check out here for more supplejack photos and information from Uni of Auckland. The other thing is soft fern fronds. 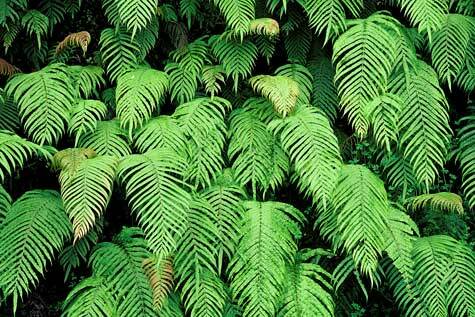 I don't think there is any poisons ferns in NZ. (maybe even in the world). However some are definitely not edible! Once you have figured out which ones are ok there is a multitude of options to choose from. Only the very young not yet uncurled fronds are soft enough to be considered edible. This means that the plant has to be growing, hence the ground must be warm and damp, so spring and Autumn are the best times for these. Also they tend to be small so you need quite a few to make a dish - I used fronds off my own ferns are garnishes / something a little different to eat. I have tried hen and chicken fern, and kiokio (above to the right) finding them very pleasant. There are many other ferns which I have yet to try. Lastly I have nibbled on kawakawa (click on left for larger picture) and also boiled it with other herbs in my beer/gruit making. Haven't tried it in a meal however.